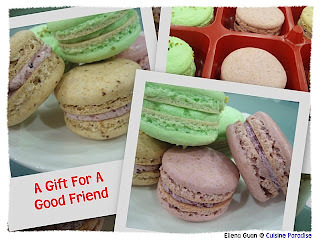 I had received this order to make 7 different flavours of macarons in one good. And the flavour is like Asian Vs the West. As you can see from the order, they have the west flavour like Rose, Lavender and Mocha. While on the other hand, we have Green Tea, Black Sesame, Lychee and Durian. I personally loves the Rose and Lavender Batch as it's so sweet in colour and aroma. 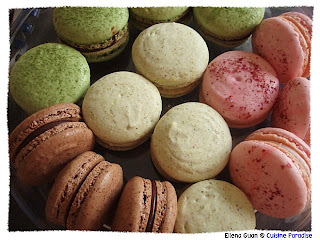 When you bite on it, you will really be drag into the dream of macarons...... or we said, addicted to it. 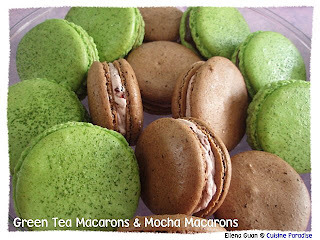 Green Tea Macarons goes well with either Dark Chocolate Ganache or Red Bean Butter Cream, but so far seems like all the order are requesting for Dark Chocolate Ganache. 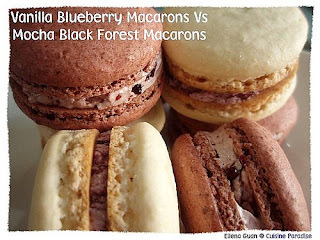 Personally I feel, Red Bean Butter Cream is much nicer than the Dark Chocolate.... :) Mocha Macaron is a mixture of Cocoa and Coffee which then sandwich with Dark Cherry Butter Cream with a dose of liquor. 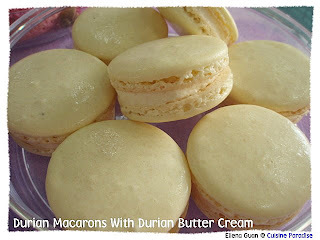 Lychee Macaron is kind of light in fragrant and taste, I added some lychee flesh in the butter cream to enhance the crunch when bites. Em... lastly, we had the very oriental Black Sesame Macaron which is kind of bitter and nutty taste. I used pure grind black sesame seeds in both the shell and butter cream paste to make it more nutty taste. 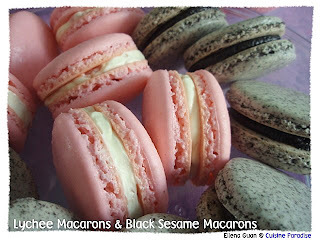 Good choice for those who love black sesame and it's really lower the sweetness of the macarons. 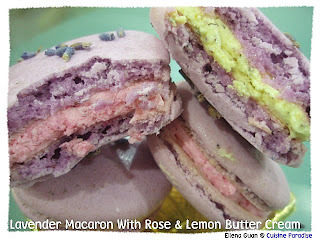 This is the Lavender Macarons that most of the blog readers enquiry about from the emails to me. 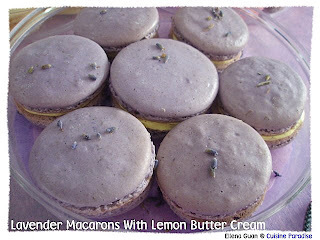 I made a batch with two different flavour using Rose Scented Butter Cream and Lemon Lavender Scented Butter Cream. 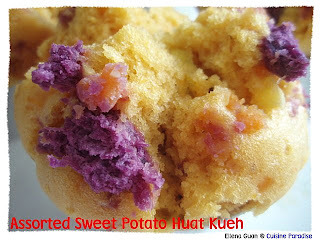 Get to know this delicious "Huat Kueh" from my boss wife Veron. 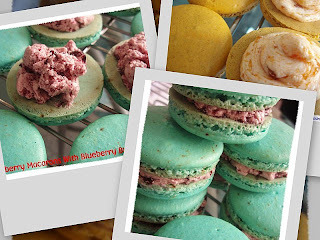 When I first taste it, I knew that I am going to do a batch of this. The texture is so moist and soft which is very different from those traditional huat kueh that we used to eat. Even if it is left in room temperature for a day or in the fridge it still taste soft and moist. This huat kueh doesn't required any yeast or baking powder and yet, but it can yet achieve the soft and fluffy texture. For my version, I added assorted Sweet Potato instead of one type. 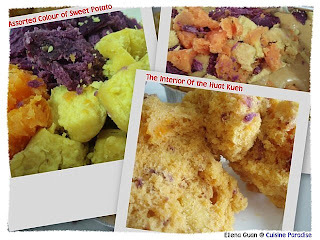 I love vibrant colours for my food and since I am able to find 3 different types of sweet potato at the stall, I might as well give it a try. 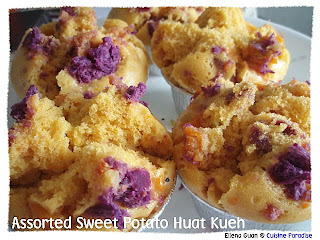 As you know the purple sweet potato had a very nice colour and it's rather kind of saltish taste which balance off the sweetness of the huat kueh and the orange sweet potato. I also add in the yellowish Japanese Sweet Potato which is fragrant and great in texture. Besides starch, sweet potatoes are RICH in dietary fiber, vitamin A, vitamin C, and vitamin B6. Despite the name "sweet", it is actually a good food for diabetics, as preliminary studies on animals have revealed that it helps to stabilize blood sugar levels and to lower insulin resistance. For those who loves sweet potatoes you might want to give this recipe a try. It's very easy, just mix, stir, pour and steam. 1. Wash and steam the sweet potatoes until soft, peel off the skin and use a fork or finger to roughly break into pieces then set aside to cool. 2. While steaming the sweet potato, place the 50ml of water and gula malaka(if possible break it into pieces so that it will melt easily) in a small saucepan and simmer over low heat until the gula malaka is completely dissolved into sugar syrup. 3. Set aside for it to cool before using. 4. Pour the self-raising flour into a big mixing bowl, then make a well in the center and pour in the coconut milk and use a balloon whisk to whisk a few times before adding in the egg. 5. Kept on whisk until the egg is incorporate into the batter then pour in the gula malaka syrup and whisk well. 6. The mixture will be sort of like a pancake batter, lastly add in the sweet potato pieces(reserve some for the topping) and use a spatula to stir till combined. 7. Spoon the mixture into a aluminium cup(100ml) then top with some extra sweet potatoes and steam over medium/high(depending on the steamer that you use, I steam mine over medium heat on stove) heat for about 20 minutes. a) You must wait for the water to BOIL 1st before placing the cup mixtures into the steam, and do not open the cover of the steam in between the steaming time or else the Huat Kueh will not have the "Open Mouth" effect. b) You can find fresh coconut milk in 250ml packet from most of the supermarket at the noodles/doufu sections. c) You can use either one type of sweet potato or assorted depend on your preference. 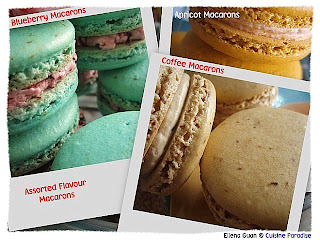 Overall for these 3 new flavour, I personally prefer the Coffee Pistachio Macaron with Black Forest Butter Cream. Because the combination of coffee and pistachio really brings out the extra fragrant of the shell. While the black forest butter cream that contain splash of cherry bandy which further more enhance the overall fragrant and texture. 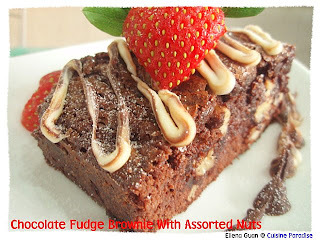 Try making this Chocolate Fudge Brownie With Assorted Nuts using Betty Crocker® Ultimate Fudge Brownies pre-mixed packet. This is recommend by one of my blog pal Evan. 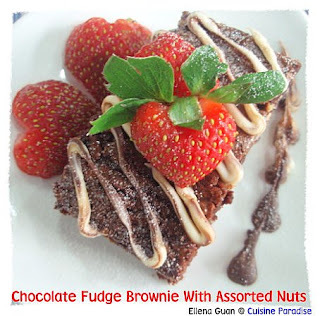 The texture of the Brownie is very moist and chewy and I really love the taste and texture compare to some store bought brownie. For this recipe, I add in an extra 50g mixture of Walnut and Macadamia nuts to make it a combination of crunchy and chewy texture. But I guess I had slightly over baked the brownie as the bottom layer is slightly drier than the upper portion. But overall I love this pre-mixed pack and I will want to give their other flavour a try too. 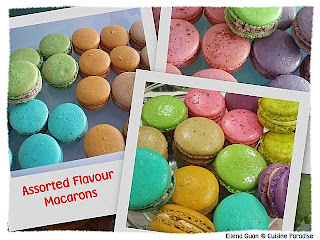 Finally I had fulfill my dream of Macarons making by doing the all those wonderful Assorted Flavour in a few batches and putting them into a gift. For this assorted flavour, I made a total of 7 different colours. I really loves my food to be in vibrant colours. Look at all these wonderful colour, my dear son loves them so much that he don't even allow me to lay my hand on them. 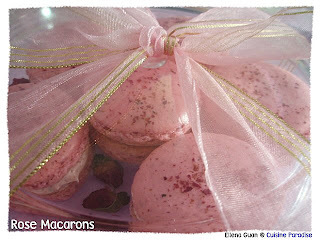 He gets to choose those colours that he wants and he loves that Pink Rose Macarons the most. 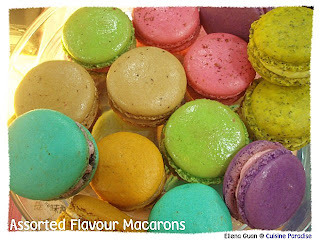 These are the 3 new flavour that I had did for this batch of assorted flavour. 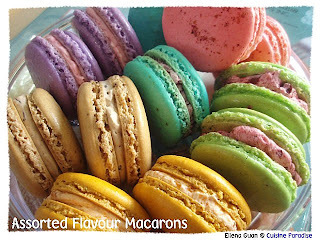 And my favourite from the list of 3 is the Blueberry Macaron which I am so attracted to it's colour. As usual, for those reader who had being following my blog for sometime, you will knew that I love SOUP. Especially those long stew soup which make me feel comfort after a tiring day of work. It's had be so long..... since I had make any of those SOUP that I long for. I love double-boiled herbal soup. especial with black chicken. But then this round, I didn't managed to grab any so I just replace it with 2 Chicken Drumsticks and it taste just as good as it is. 1. Wash the chicken drumstick, remove fat and skin then blanch in boiling water for a few minutes, remove and rinse with water then set aside. 2. Rinse all the dry herbs then add about 700ml water in a small pot and boil the herbs for about 5 - 10 minutes over medium heat. 3. Next add in the chicken drumstick and bring it to boil again. 4. Pour the soup and ingredients into a double boiler and place it in a bigger pot/slower cooker and add enough water to cover about 3/4 of the double boiler pot. 5. 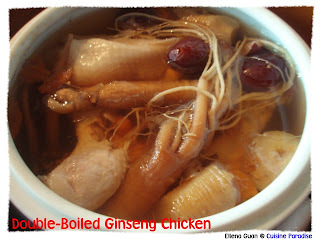 Double-boiled over Auto heat(slower cooker) for about 3 - 4 hours then serve during meal before rice or before bedtime. a) The purpose of adding dried longan is to enhance the sweetness and taste of the soup. b) If you are not sure about the double-boiled procedure, please refer to this link for picture.